Jonathan Rose Closes On 183 Montague Street, More Condos To Come? Developer Jonathan Rose Companies closed on 181-183 Montague Street today, The Real Deal reports. The bank building, currently home to a Citibank branch, comes with development rights of 93,500 square feet according to the report. TRD: No permits have been filed with the Department of Buildings for any alterations or a new building at the site, but Rose purchased the property under the name Montague Pierrpont Apartments, LLC, which could indicate he is looking to convert it into a residential building. 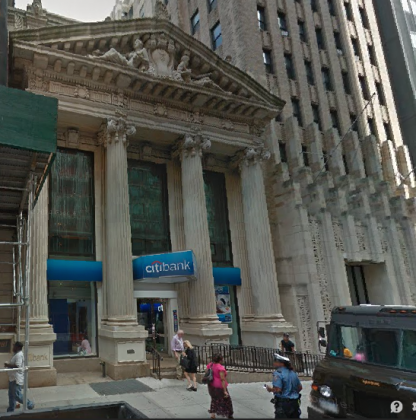 Citibank currently occupies 9,350 square feet of retail space in the building. Another 21,700 square feet of the property, which goes through Pierrepoint Street, is used for office space. 183 Montague Street was built in 1909 as the People’s Trust Bank building. Does he have air rights on this building? It’s not that tall a building. When you are inside the building, it doesn’t seem very nice, but looking at it from the outside, it is quite an impressive building. I have to wonder how long it will be before Jonathan Rose Companies scoops up lot 13. Recall they recently filed demolition plans for 146 Pierrepont (lot 26) and 189 Montague (lot 11). Make them buy a new school, and a hospital for the residents. The rear portion of lot 15 (the Citibank building) facing Pierrepont Street was designed by Shreve, Lamb & Harmon, architects of the Empire State Building. ful press? Only You can prevent it. That’s the impression I got from the article–which most likely means another behemoth high rise building coming up over the historic building–though I certainly hope that won’t be the case! Is the bank branch definitely going to go then? Such a shame to lose it as it was so convenient! We’re losing all useful business and utilities in the neighborhood for condos and chains it seems! Downtown/BH is one of the largest concentrations of transit infrastructure in the entire city. There is no reason (apart from nimbyism) not to have more housing near it. Why doesn’t anyone think here, more towers and more population crammed into a small area and the same amount of police/fire/ems..good luck..and by the way guys these buildings will be build to a budget not to any safety standard. Want to think how to for example fight a high rise fire in one of these buildings?